A little over a year ago I decided to build a treadmill desk based on the design at treadmilldeskdiary.com. I’d been having back issues (since resolved surgically) and figured the additional exercise would be good for that and better health in general. 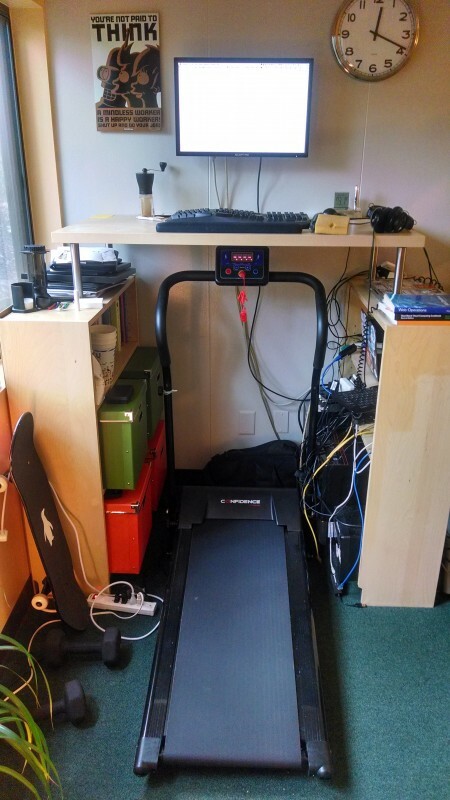 I followed treadmilldeskdiary.com‘s setup almost verbatim, the same model of treadmill ($250 on Amazon) and silencing the alarm. The default setting of 1 mile per hour is perfect for a walking desk and the timer conveniently runs for 30 minutes. I already had the IKEA bookshelves and purchased the tabletop with legs for less than $50 total. I wall mounted my monitor and have another on my desk next to the treadmill desk. I switch video cables to my laptop and physically move my keyboard and trackball when I move between desks. Walking on the treadmill while working is not as distracting as you might expect, I have enough focus for reading and responding to email, browsing the web or talking on the phone. I typically start my day with a half hour on the treadmill doing email and catching up on the latest news, occasionally I eat lunch while walking. If I’m on a conference or phone call the chances are very good I am on my treadmill. My decidedly low-tech approach to tracking time and distance are tick-marks on a post-it note (each half an hour at 1 mph). I typically average at least an hour a day, despite travel and a few weeks of recovery for back surgery I walked 199.5 miles in 2013. The treadmill is quiet and the maintenance is simple. Luckily I have a private office with plenty of space, so I don’t annoy my coworkers except while video conferencing. If your working arrangement is amenable to it, I highly recommend a treadmill desk. UPDATE: Only 85.5 miles in 2014, a bit more travel and feeling better lead to less mileage. Gonna shoot for more in 2015. UPDATE 2: Only 44.5 miles in 2015, too much travel but still feeling good. 2016 probably will be about the same. UPDATE 3: Only 26 miles in 2016, that’s because I packed up the treadmill and moved to Australia mid-year.